OSAT (One Step at a Time) owes its existence to a recovering alcoholic named Jim Hinkhouse. Jim (also widely known among his friends as "Jimmy") was born and raised in Scappoose Oregon, on the banks of the Columbia River downstream from Portland. He was a talented, multi-sport athlete in high school and college, and graduated from the University of Oregon in the early 1960s. His built a career in mathematics and economics, working for Boeing, Wharton Econometrics, and Weyerhauser. In 1978 Jim acknowledged his dependence on alcohol, and began a life of sobriety. In the 1980s he developed an interest in mountaineering, joining the Seattle Mountaineers and took their basic and intermediate climbing classes, and eventually became a climb leader for that organization. When he switched jobs from Weyerhauser back to Boeing, he joined the Boeing Alpine Society, and became an even more avid climber. Jim identified the moment of inspiration for a mountaineering program for recovering alcoholics as occurring on a New Years Day hike up Mount Si near North Bend, Washington, January 1, 1989. He had celebrated his tenth year of sobriety the previous October, and as he hiked up the trail that day he reflected on how his recovery from alcoholism had been enhanced by his experiences in mountaineering, and how much satisfaction he had derived from becoming an AA sponsor to an old friend to help him "get off the booze". Self-acknowledged procrastination gave way in 1990 to a commitment to get started implementing his idea. He offered to teach his basketball team ("The Irish Curse") the skills necessary to climb Mount Rainier. Following several months of outings, the group made an unsuccessful attempt on Memorial Day weekend, turning around at Camp Muir in deteriorating conditions. But in the following months, Jim marshalled the help of a number of mountaineers who were also in recovery, and began talking about the idea at AA meetings around Seattle. In 1991, Jim organized the "1991 AA Mount Rainier Expedition", an effort which quickly developed into a regular weekly AA meeting atop Tiger Mountain outside Issaquah Washington, and an affiliated club, both of which adopted the name "One Step at a Time". In 1994, at age 51, Jim retired from Boeing to focus his efforts on his concept of merging a mountaineering regimen with alcohol and drug dependency counseling. He began work to establish a consulting company to take the concept to executives and companies in the Seattle area. He also organized an expedition to Mount Kilimanjaro by sixteen members of the club. He also began writing a book about the beginnings of OSAT, the draft of which has been serialized in the Yodel newsletter. Although his new lifestyle offered more time to devote to OSAT, he was careful in guiding the club toward becoming self-sustaining organization and eschewing the temptation to provide full-time hands-on leadership. In May of 1995, the opportunity came for Jim to join two other OSATers on a climb of Denali/Mount McKinley, the highest point in North America. Jim and his two companions, Scott Hall and Tom Downey, made it as high as 17,000 feet on the mountain. In the end, during one of the worst May climbing months on record for the mountain, they abandoned their climb attempt. After waiting out weather for several more days, the three OSAT climbers joined with four other groups in a retreat from the mountain. During the climb below the West Buttress base camp, the OSAT climbers helped in a crevasse rescue of another group, and as a result were the last of the rope teams descending. Weather deteriorated, and at Windy Corner the teams were slowed by horrific wind conditions that were lifting 80-pound sleds off the snow. Four teams made it around the corner and bivouaced below, while the OSAT team decided to set up camp in a crevasse above the corner. Jim, Scott, and Tom were found two days later when the storm abated, apparently victims of hypothermia while trying to establish their bivouac. Amemorial for the OSAT climbers was held at the Mountaineers lodge in downtown Seattle. Jim's family donated his extensive library of mountaineering and recovery books to OSAT, and six months later a memorial plaque was installed by the club at the OSAT-AA meeting site near the summit of West Tiger 3. Jim's obituary was published in the 2006 American Alpine Journal, and OSAT member tributes appeared in a special memorial issue of the Yodel, excerpts of which are on the last two pages of the the summary of the first five years of OSAT history. "Let children walk with nature, let them see the beautiful blendings and communion of death and life, their inseparable unity, as taught in woods and meadows, plains and mountains and streams of our blessed star, and they will learn that death is stingless indeed and as beautiful as life." Five years after Jim's death, the club successfully petitioned the State of Washington, and subsequently the US Board on Geographic Names, to officially name the mountain immediately north of Washington Pass "Hinkhouse Peak" in recognition of Jim's unique contributions to the Washington climbing and recovery communities. During the initial years of OSAT's existance, Jim Hinkhouse spoke of writing a book about OSAT's beginnings and its unique marriage of recovery and mountaineering. Shortly after retiring from Boeing in 1994, Jim took a course in writing at Bellevue Community College (now Bellevue College), and began outlining his concepts for such a book. At the time of his death in May 1995, Jim had contacted possible publishers for the book, had fully outlined it, and had written text for nearly one-third of the material he outlined. 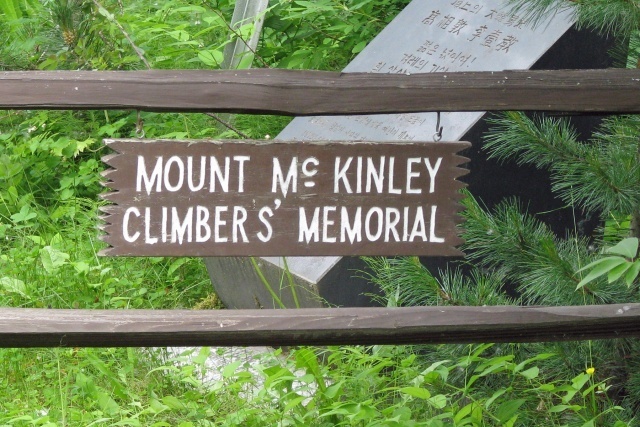 The manuscript laid dormant for over five years, but after the naming of Hinkhouse Peak in 2000, Jim's son provided a hard-copy of the material to the club. Since March, 2004, the fully drafted portions of the book have been published in the Yodel. Anyone interested in the history of One Step At A Time should begin here. The following Table of Contents, as laid out by Jim in his draft, is used here as an index to the Yodel serialization of the portions of Jim's book which he completed. Links are to the .pdf files of the Yodel editions in which chapters of the book were published. The serialized publication, and thus this index, is a work in progress. October 2008 - Life is More Fun with Alcohol - The seductive aspects of alcohol, and chapter outlines covering the rest of his life up to and including recovery. Where have all the Climbers Gone? In 1999, OSAT applied to the Washington State Board on Geographic Names to name a peak in the Cascades in honor of its founder, Jim Hinkhouse. The initial application was withdrawn at the request of the Board, because the peak that had been selected bordered on the Alpine Lakes Wildnerness Area, and the Washington board had previously determined that the US Board on Geographic Names was adverse to adding new names to designated wilderness areas. After working with the board's staff, a new peak was selected for the application. The new application moved through the approval process during 2000, and on December 14, 2000, the Washington board approved the designation of the summit immediately north of Washington Pass as Hinkhouse Peak. Six months later, the designation was approved by the United States Board on Geographic Names. A history of Hinkhouse Peak was published in the Summer 2005 issue of the Northwest Mountaineering Journal. The peak is also described in some detail on the SummitPost.org page. Articles about OSAT club climbs of Hinkhouse Peak have appeared in the Yodel in 2001 both before and after official designation, 2004 and 2007, and there is a nice photo-trip-report of climbing the technical North Ridge by two climbers not associated with the club.